Hi everyone! So we've noticed a little something...some of us are a little nervous when it comes to working with torches and fire. Even if you've watched our Butane Torch Safety video, our Facebook Live episode about torches and read our safety tips, if you just aren't comfortable using a torch, don't. 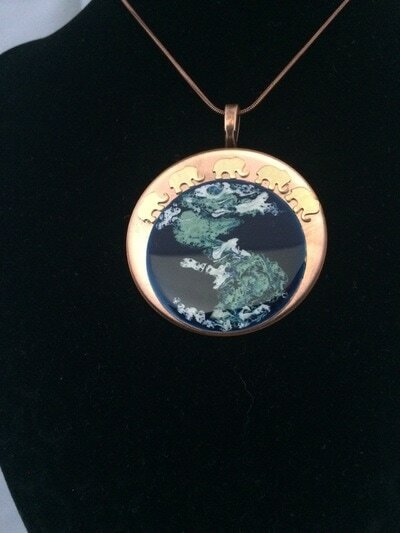 But what if you LOVE enamel and want to create something very cool? Well there is hope! Meet Laura Petrisin at My Art You Wear Jewelry. She shows us a fantastic way to get that gorgeous enamel look without all the fire. Let's get started! I have been a painter for over 20 years working with various mediums such as oils, watercolors, and inks. I love color! When I turned to jewelry making with metal blanks, I found myself in a dilemma. I could add color to my metal with enamel. 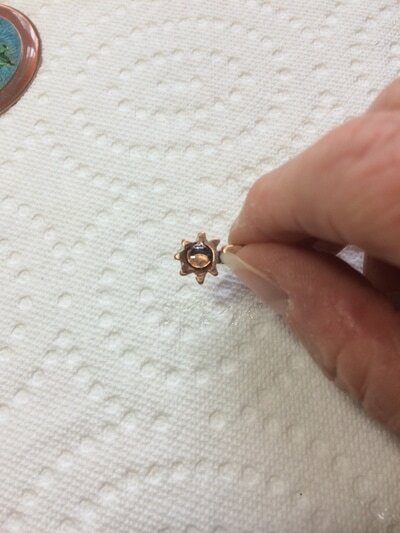 The only problem is that enameling calls for fire and I'm nervous around fire. 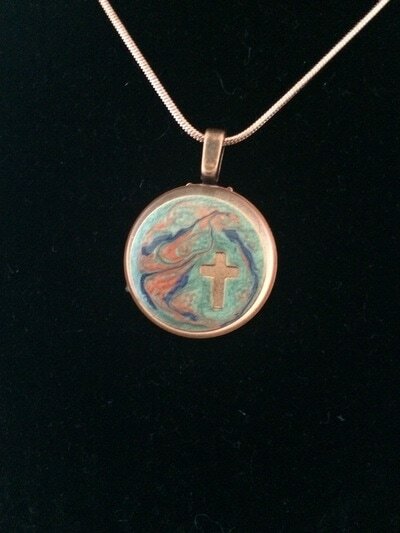 After some research, I found a way to add color to my jewelry with a special paint that is conducive to metal. The paints are Pebeo Fantasy paints. 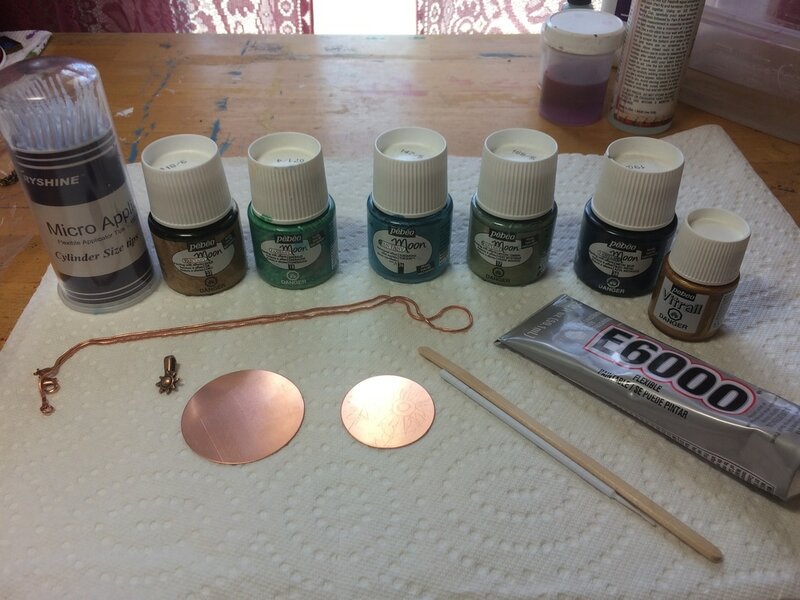 Fantasy Moon Paints create textured, hammered and pearlescent effects. When first applied, the paint seems to take on a life of its own, moving and swirling on the surface.. Vitrail paints have a transparent quality similar to stained glass. When the two paints are combined, magic happens. The metal blanks I choose to use are from Beaducation. The blanks are quality and the delivery is fast! I also like the fact that they categorize their blanks according to type and shape. I could find what I wanted quickly without searching for an hour. 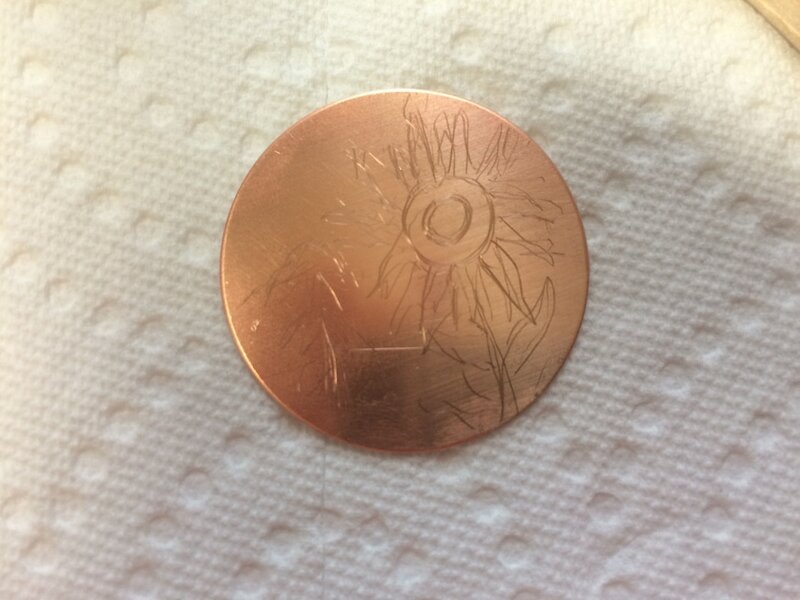 I took the 1.5 copper blank and sketched a sunflower on it with a pencil. This was just to give me an idea in my mind of where to lay the paint. I stirred the Fantasy Moon turquoise paint with a popsicle stick. It is important to stir the paint for two minutes or so to get the best results. Fantasy paint is thick. 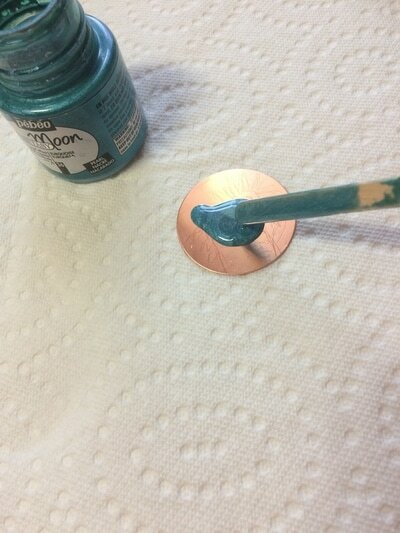 Then I used a popsicle stick to spread it onto the 1.5 copper blank until the blank was covered evenly. Look at that beautiful marbled effect! Next came the Fantasy Moon gold paint. I used a micro applicator, otherwise known as a dental brush, to drop the gold paint into the turquoise. 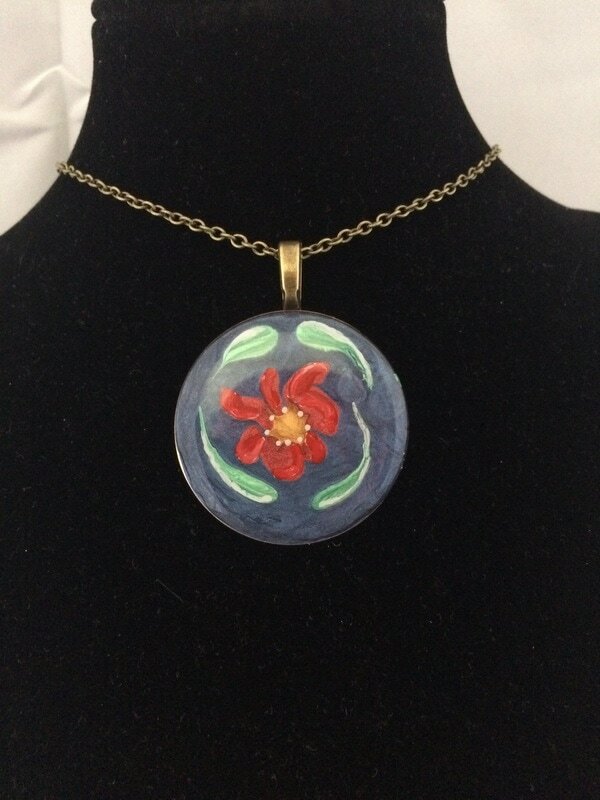 I guided the paint gently from the center outward to make the petals. Using Vitrail Orange paint, I created the head of the sunflower, dropping the paint in a bit at a time and guiding it in a circular fashion. I created the first layer of leaves and stems with Fantasy Moon Mystic Green, again dropping the paint in and guiding it with the micro applicator. I wanted to brighten the leaves and stems, so I added Fantasy Moon Emerald paint. 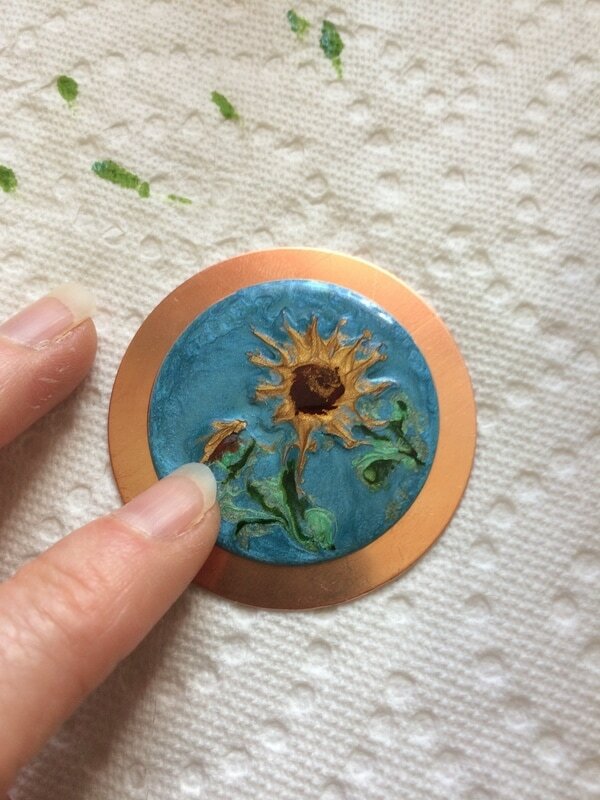 To highlight the painting, I used Vitrail Orange on the sunflower, and Vitrail Green Apple on the leaves and stems. 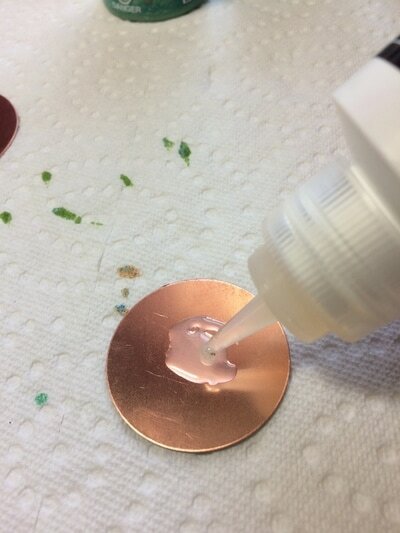 At that point, the painting on the 1.5" copper blank was done! Now it was time for the other 1.91” copper blank! This blank was going to serve as a frame for the painted blank. I used Sun And Moon craft glue as an adhesive to keep the painted blank in place while I poured the resin. 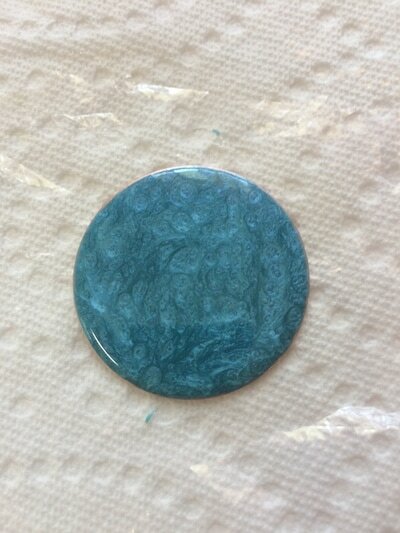 After 20 minutes or so, the glue was dry enough to pour the resin. I use ice resin, which I like because of its ease and quality. I poured one part resin to one part hardener into a small measuring cup. NOTE: The mixture has to be stirred constantly for two minutes until clear. Resin usually comes with plastic applicators with which to stir. 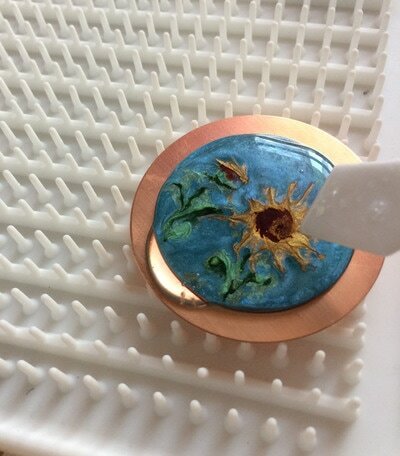 The copper blanks were placed on a rubber doming tray which is great for allowing extra resin to run off the blanks and not pool onto the piece. Then, I poured the resin onto the middle of the painted blank and moved the resin outward with the applicator until it completely covered the surfaces of both blanks. 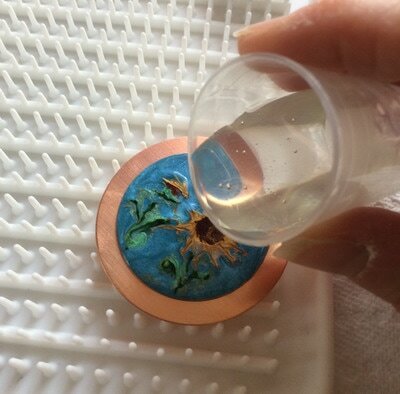 I left the resin to dry for 12 hours, covering the piece with a plastic cup to prevent any dust from settling on it. 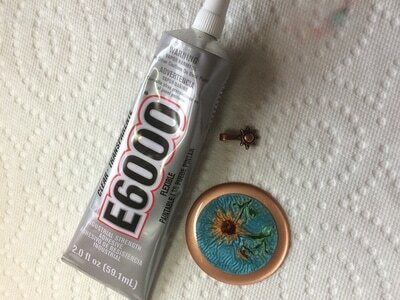 After the piece dried, I attached a copper bail to the back using E6000 glue which is an industrial strength adhesive. I let it dry for 48 hours. 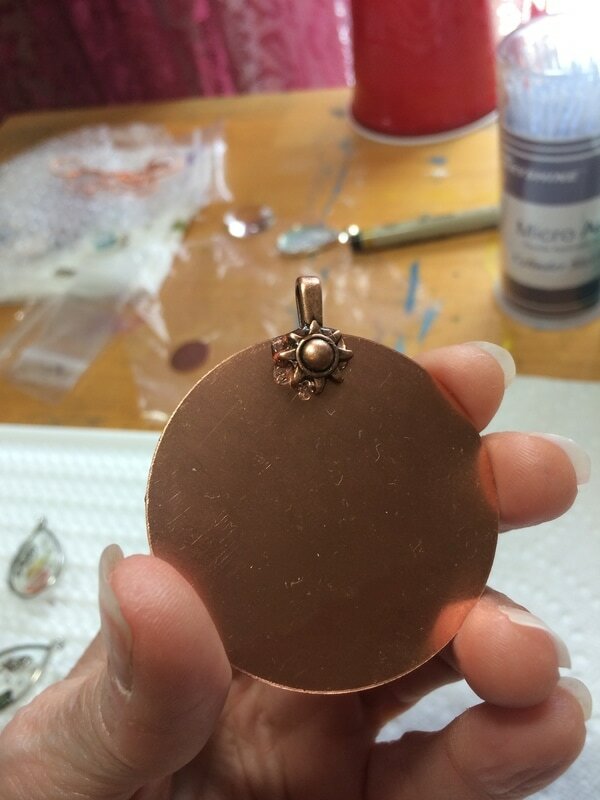 When the piece was dry, I attached it to an 18" copper plated snake chain and it was ready to wear! ​Below are some other necklaces I created using Beaducation metal blanks and Pebeo Fantasy paints! Thank you to Laura for such a cool solution for those of us that like the enamel look but prefer to not use torches. 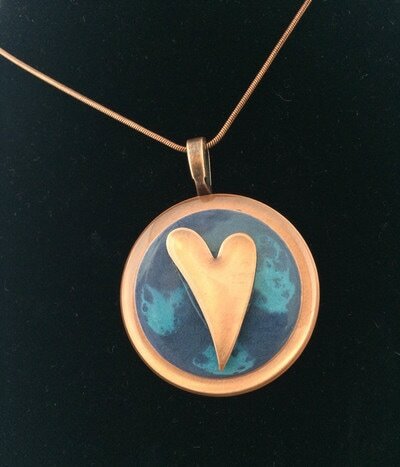 Visit Laura Petrisin at My Art You Wear Jewelry to see more of her beautiful necklaces, also available for purchase. Stunning work! I love how these particular paints give the pieces such movement and life. Beautiful work Laurie!